Currently, L’mage Salon Studios in Chandler is home to hair stylists, barbers, estheticians, nail technicians, and massage therapists. 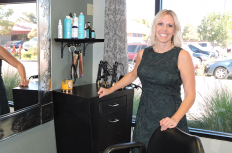 If you’re looking for talented hair stylists, beauty or wellness specialists in Chandler, then check out our family of wonderful professionals. Our professionals occupy 22 private “Suite Spots” in over 6,000 square feet. The suites come in a variety of shapes and sizes, including singles and doubles, with the scope for triples too depending on the tenant’s needs and wants. We have just a few vacancies remaining, so if you’d like your very own Suite Spot, contact us today for a tour. I’ve been in the business for 22 years. I attended school in Iowa City. I worked for Rumours, an Aveda Salon, for 4 years. I moved to Kansas City and worked at Xiphium Salon, also an Aveda Salon, for 2 years. I became a certified color educator for Aveda and did that for 2 years while working behind the chair. 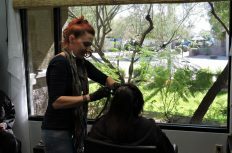 I moved to Arizona and worked at Taglio Salon in Scottsdale for 8+ years. After having my son I decided to go independent and open my own salon studio to be closer to home and have some flexible hours. I have attended training with Aveda, Bumble and Bumble, Goldwell, GK Keratin straightening, Keratin Complex, Oribe, Vidal Sassoon, American Crew and many other companies to grow my craft. I also like to freelance doing wedding hair. I have been featured in a number of wedding blogs including Style Me Pretty. I currently volunteer at 2 hospitals working as a licensed Cosmetologist with the Look Good Feel Better program. I teach cancer patients how to deal with the outward appearance side effects of treatment. I have been with the program for 16+ years and have recently become the Area Trainer for the Phoenix area, teaching other professionals how to teach our 2 hour workshops. FTR is an international Hair Care Specialist For Ladies & Gentlemen, Specializing In Color Correction. FTR offers top of the line service and products. Starting her career over 45 years ago in Hair care and Fashion, FTR offers the latest trends in styles and color to her clients. FTR is very passionate about making sure her clients not only look good, but feel good about themselves when they walk out of her studio and they are 100% satisfied with their experience. I have been a hair stylist for over 15 years, unless you count from when I taught myself to French braid at 7 years old – that might add a few more! I have worked with Phoenix Fashion Week for various events, have several published editorial creations, and I have won Bride’s Choice Award on WeddingWire.com 3 years in a row. I also thrive on continuing my education to be able to customize cuts, colors, highlights, and styles for each individual that visits my studio. “Be your own kind of beautiful” – Marilyn Monroe. 30 years experience specializing in Cut, Color, Weaving. I have been in the beauty industry as a stylist for 21 years. Originally from Kansas City, I have lived in Arizona since 2002, starting at a resort, then followed by 3 years at Salon XS in Mesa. I have been self-employed with L’mage Salon Studios for almost 10 years and very much enjoy the freedom of being an independent contractor and the environment L’mage provides. MARVELous FANatic Salon LLC is a men’s specialty salon for comic book and anime fans! Owner and super heroine, Stephanie Nicole, provides quality care with a fun atmosphere that’s perfect for geeking out. Stepping into MARVELous FANatic Salon ensures that you will leave looking your best while enjoying all things superheroes, supernatural, and super geeky. Stephanie graduated from the Avalon School of Cosmetology in 2013 where she specialized in men’s hair care. A self-proclaimed huge comic book and anime geek, she wanted to combine her love of cosmetology with her love of nerd culture. Ultimate move for kids 12 and under: Choose your favorite comic book from our collection and read it to Stephanie for $3 off your haircut! “The Punisher” Discount: 20% off all services for Military, Firemen, and Policemen with proper ID! Full hair salon service. I have been in the hair business for over 35 years. My services include haircuts for men and women, perms, OMBRE & hair color, highlights, updo for special occasions, and special threading. I have 42 years behind me in this fascinating and ever changing industry. I enjoy it as much now as I did when I started. Keeping up with the changes keeps creativity alive! My love for hair started as a small child combing my Mom’s hair and my Aunt taking me to a Vidal Sassoon Salon and getting my first professional haircut in the 4th grade. I was awestruck by the magic of the salon and its stylists. I attended Allure Beauty College in Scottsdale and am a Master Colorist from Redkin. I can correct color to High Fashion; my specialty in color is foilings. I have been blessed with generations of clients who have been with me since the beginning of my career. Professional barber dedicated to helping clients achieve their desired look. Personal barber to many professional athletes and also capable to do designs. Dominican stylist from New York. Caring about your natural hair and educating you along the way about how to better care and style your hair on a daily basis. At Lustre, Eva offers a variety of skin care services including customized facials, back facials, peels, microdermabrasion, dermaplaning, face and body waxing, and eyebrow tinting. In addition to aesthetic services, more specialized services are offered, including classic eyelash extensions and microblading. Eyelash extensions have become increasingly popular to enhance the natural eye and Eva received top notch training and uses top of the line, high quality products on all of her clients. Microblading is also a specialized service, in which Eva is certified. It is a form of permanent makeup that mimics hair strokes to fill in or reshape the eyebrows. Eva is passionate about the services she offers and is constantly seeking continuing education to keep up to date with new trends and improve the services provided. Keeping clients happy and safe is a top priority. Established in 2014, KB Esthetics is the partnership of Bethany Pringle and Kacie Ranschaert. Both Kacie and Bethany are certified estheticians with a combined 23 years experience. After meeting and working with each other at a local corporate salon and spa, the two went in different directions. They remained friends and eventually decided to go into business together. Some of the services include PCA chemical peels and Emminence Organic treatments. Bethany specializes in microdermabrasion, dermaplaning, and facial treatments. Kacie’s specialties include Brazilians, brows, and all body waxing using both hard and/or soft wax. They provide a comfortable atmosphere in a secure, private studio. We look forward to providing you with excellent service. I am a licensed esthetician, certified lash artist and lover of all things beauty. I have a passion for bringing a natural approach to skin care, waxing and eyelash extensions. I graduated from the Southwest Institute of Natural Aesthetics in March of 2018 and am eager to begin my career in the esthetics industry. Melle Skin and Wax Co. is driven by our passion to help people and our love of all things skincare. We met our very first day of esthetics school and very quickly developed a bond over skincare and our shared philosophy that service to our clients goes beyond skin-deep. With over 10 years combined experience in esthetics, our mission is to facilitate confidence in every client who walks through our doors in a relaxed and welcoming environment. Thank you for trusting us on this journey to meet your skincare needs and goals. Whether it’s to achieve smooth skin, anti-aging, hair removal, or just taking some time for yourself, we promise to always provide consistent service and to continue our education to provide you with the most up to date treatments and information in the industry. We hope your experience with us is as unique as you are! Former computer analyst now utilizes those 25 years of analytical skills to create a custom massage, unique to each person, incorporating elements of whatever modalities are required (e.g., Chinese medical massage, lymphatic drainage, deep tissue, etc.) to help the body heal. 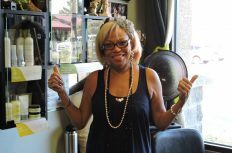 Barbara has owned the Wellness Center for 12 years and believes massage is just one important element of overall wellness.